The American Treasure Tour has a little bit of everything. While our amazing collection is easily dominated by our automatic music machines (nickelodeons and band organs and the like), you will also find classic cars, circus art, movie posters, miniatures and, well, practically everything else. We are very proud of our museum - especially the fact that we have an indoor electric tram to take you around it - but we can't honestly say that we exactly specialize in one element of Americana or slice of our national culture. (We are a pie of many slices!). That said, fear not. There are other sites scattered around the nation that concentrate specific passions. If you love PEZ, we recommend a trip to Orange, Connecticut to the PEZ Visitor Center, with its factory, museum and gift shop. If you're into comic books, head to Baltimore, Maryland and the Geppi's Entertainment Museum. 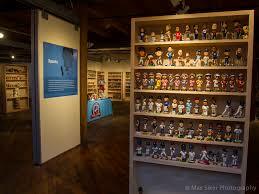 And if you're into bobbleheads, your destination for that is coming in Milwaukee, Wisconsin. Yes, the National Bobblehead Hall of Fame and Museum will be opening soon in downtown Milwaukee, honoring great athletes, scholars, and others (including famous weatherman Al Roker, obviously). Check out their website here: and know that goodness is on the way!